There's a popular saying "No life without wife".Cricketers may be in love with bat and ball in field. But who takes care of them outside the field?? Cricketers, in some countries are immensely popular among youth and have a mass following. Although glamour in cricket is a new-borne, they are regarded equal as movie stars in many parts of the world. So it doesn't amaze us they own the sexiest women in the world.Here we compile top 10 list of sexiest partners of the cricketers. Christina Mallika Sirisena, a travel consultant, frequently presents herself in cricket matches played at home. 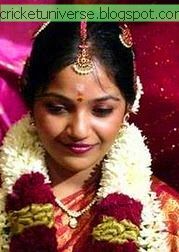 We have witnessed sudden increase in form of Srilankan former captain after marriage. Many of Indian cricket fans may not be much fond of this pretty girl because Sehwag started underperfoorming in several matches after marriage.Sehwag married Aarti Ahlawat in April 2004 under heavy security cover in a widely publicised wedding hosted by Arun Jaitley, the then Union law minister of India, at his residence. The couple have a son, Aryavir, born on 18 October 2007. Ian Harvey could not make the most of his chances in the Australian team. It seems he made all the right moves when selecting his better half - Amanda Harvey. Simon Katich doesn't seem to hit the ball too well these days, but he has a good looking wife in Georgie Willis. Murli got many batsmen out in his career, but he was stumped by this lovely lady from South India.Their first child, Naren, was born in January 2006. Yehali was his long time partner.On 30 June 2009 Sangakkara's wife gave birth to twins, a girl and boy. He may have failed as a cricketer and as a Bollywood actor. However, he can count on many a hoarding for Bollywood movies with wife Andrea Kambli's (formerly Andrea Hewitt) face plastered all over. He married Rachael Wools on 5 March 2005 at the 30 Pavilion Road Hotel in Knightsbridge, London. They have three children: a daughter, Holly (born 6 September 2004); and two sons – Corey (born 9 March 2006), and Rocky (born 7 April 2008). He has the names Rachael, Holly, Corey and Rocky tattooed on his left shoulder. The receding hair line and prominent bald patch on the top of his head didn't hold Jaques Kallis back from pulling in the stunning former Miss South Africa, Cindy Nel. Any relation to Andre? This is Graeme Smith's ex-girlfriend, Minki Van Der Westhuizen. The South African model has been such a hit with cricket loving men the world over that, one gentlemen was forced to ask, "How the **** did Graeme Smith get her? "At a glance,you can realize why we put an ex in top of our list. How do you find our list. Don't forget to post your opinion in comment section below.